I made this wedding/anniversary card for the sketch challenge at Karen's Doodles. I created in white and backed each piece in pink. I then added cotton candy stickles to all the pink cardstock and to the image. 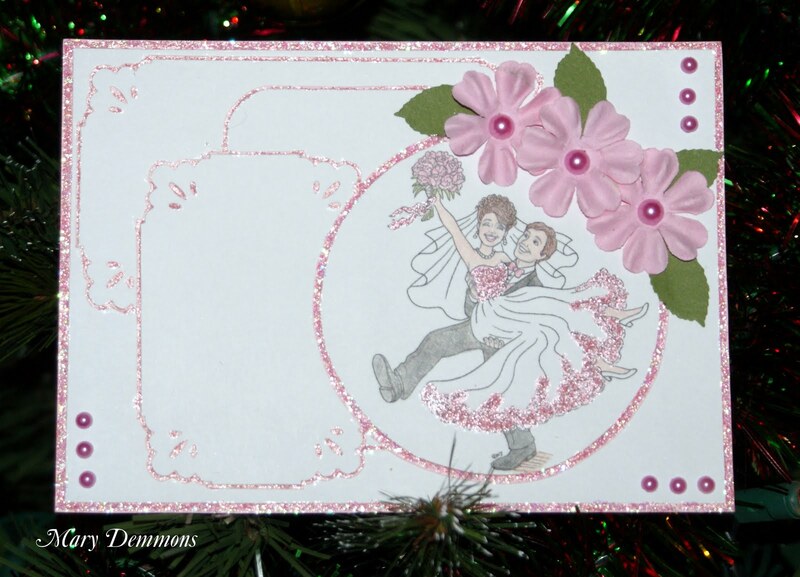 I finished off my card by adding 3 pink flowers and pink pearls. Mary this is just beautiful! This is one of my favorite images of Karen's- it is spectacular. Such a fun card, Mary! I love the pink backing and all the sparkle! Great take on our sketch! Mary, this is just beautiful, what lovely soft colors and love all the sparkle. Good luck and thanks for joining in on the fun at Karen's Doodles challenge blog. Beautiful! I luv all the pink. Thx for joining us at Karen's Doodles challenge. Good luck!